Mark Altaweel and Alessio Palmisano contributed equally to this work. The online version of this article ( https://doi.org/10.1007/s10816-018-9400-4) contains supplementary material, which is available to authorized users. Urban scaling has been a major research topic not only for those interested in modern urbanism (Bettencourt et al. 2010; Bettencourt 2013; Batty 2013; Schläpfer et al. 2014) but also those studying the past (Ortman et al. 2014, 2015; Cesaretti et al. 2016; Ossa et al. 2017; Smith 2018). Urban scaling work builds on theory that frames human settlements as social reactors (Bettencourt 2013), where generally bigger cities create social interaction opportunities that result in greater socioeconomic outputs per capita (e.g., incomes, transport networks, technological innovations). These outputs scale relative to the population of the city. Several past studies have demonstrated systematic power law regularities between population size and socioeconomic outputs (e.g., Pumain et al. 2006; Bettencourt et al. 2007, 2010; Batty 2008; Samaniego and Moses 2009). Other earlier anthropological work has looked at issues of system scaling and complex organization, where larger systems have been argued as creating conditions for greater social complexity and evident qualitative change to social structures (e.g., Carneiro 1967, 2000). Intensification of interactions and feedbacks can help create ever larger and more socially complex societies (Johnson and Earle 2000). Power law relationships are also found in non-urban societies and their dwelling areas (Wiessner 1974). While works on scaling could potentially investigate social transformations, scaling can also inform how population affects other urban systems, including those that have economic implications (e.g., wealth, transport network, household consumption, water supply system). There are three kinds of urban scaling between population size and the magnitude of socioeconomic outputs: (1) linear, where the output has the same growth rate as population; (2) superlinear, where the output grows at a higher rate than population, and (3) sublinear, where the output increases at a lower rate than population. For factors such as innovation and wealth, cities have shown a pattern expressed by superlinear power exponents at around 1.15 (Bettencourt et al. 2010), while systems such as transport are typical of economies of scale that reflect efficiency accommodating increasing populations, making them sublinear (Bettencourt et al. 2007). For ancient urban systems, the challenge has been to find relevant measures that can be easily compared to population in a similar manner for modern systems that can demonstrate such power law relationship. Work by Ortman et al. (2014, 2015) demonstrate socio-economic relationships that are similar between modern societies and past New World settlements (e.g., population and residential settled area, public construction rates). However, relative few proxies from different archaeological settings have been used (e.g., estimated settlement area, area of public plazas and monuments, number of inscriptions; see Cesaretti et al. 2016; Hanson and Ortman 2017; Hanson et al. 2017; Ossa et al. 2017). This work represents an exploratory analysis into the scaling relationship between settlement area and remnants of past interurban roadway systems. Such a focus has not been conducted before and, therefore, our results are a preliminary assessment. One area where data afford an opportunity to compare relationships between proxies for urban population and other measures is the Near East i (Fig. 1). Particularly in northern Mesopotamia, mounded Late Chalcolithic (LC) to Bronze Age (ca. 4200–1200 BCE) sites, such as those studied from different surveys, are often clearly visible on satellite imagery along with remnants of ancient roads, termed hollow ways (Wilkinson 1993; Fig. 2). This provides an opportunity to understand how interurban road networks and roads that connected agricultural areas relate and scale to mound area. In effect, if mound area reflects a proxy for population, then the relationship between mounds and hollow ways can inform on how past road systems were affected by and related to population. 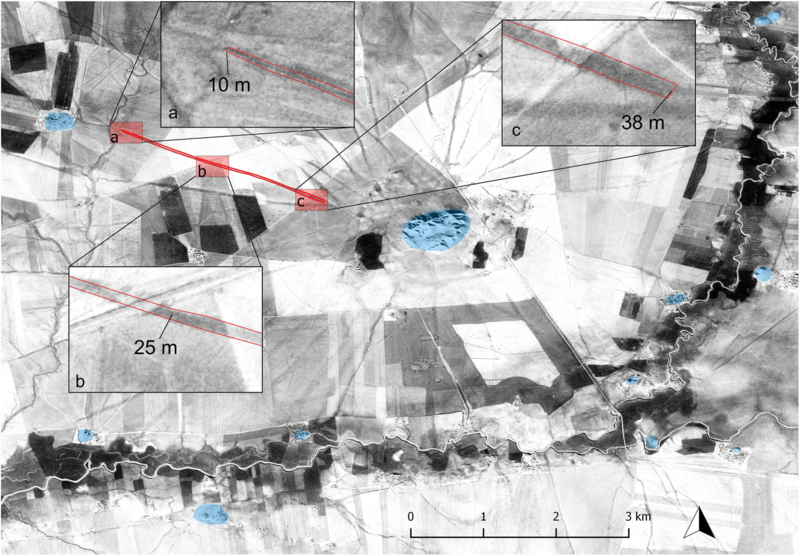 This also informs how agricultural landscapes and settlements interacted. That relationship, represented in a developed model, could be used to forecast characteristics of ancient roads that are missing. In presenting this work, we first provide background data on the archaeological data used to measure urban scaling. Then, the research method undertaken to determine the relationship between urban area and hollow ways is presented. Different results are given based on varied site areas and hollow ways, including how they may affect measurement values. The implications and archaeological significance of the results are discussed, helping to extend the finds for other cases. In concluding, methods to improve the results and future direction are presented. For the purpose of this paper, we chose the Khabur Triangle (KT) as the case study, an area located within the Syrian-Iraqi Jazira, measuring some 37,500 km2 and extending between the Tigris and Euphrates rivers. It is bounded by what is today the Syrian and Turkish border to the north, the Jebel Sinjar and the Jebel ‘Abd-al-Aziz to the south, and the Khabur River to the west (Fig. 2). The choice of this region is motivated by the wealth of archaeological settlement data spanning between the late fourth millennium and the late second millennium BCE, which is the result of an intensive survey research activity in the past three decades, as indicated in Fig. 2, and by the good state of preservation of hollow ways. From the end of the fifth millennium BCE to the end of the second millennium BCE, the KT was characterized by fluctuating trajectories of social complexity in urbanization, administrative hierarchy, political structure, and agricultural and transport infrastructures. Although there is a general tendency among scholars to consider southern Mesopotamia as the heartland of early social complexity and urbanism (Algaze 2001, 2008; Liverani 2006), in the KT during the LC 2 (ca. 4200–3800 BCE), settlements such as Tell Brak, al-Andalus, and Khirbet al-Fakhar reached large areas (55, 64, and 30 ha respectively), with high population densities possibly reached earlier than sites in Southern Mesopotamia (Ur et al. 2007, 2011; Oates et al. 2007; Wright et al. 2006–2007; Ur 2010a, b; Lawrence and Wilkinson 2015, 329–333). During the LC 3–4 (around 3800–3300 BCE), Tell Brak grew steadily and reached an area of 130 ha (Ur et al. 2007, 2011), which may have epitomized north Mesopotamia’s early urbanism and showing traits of complex societies such as political centralization and economic specialization. 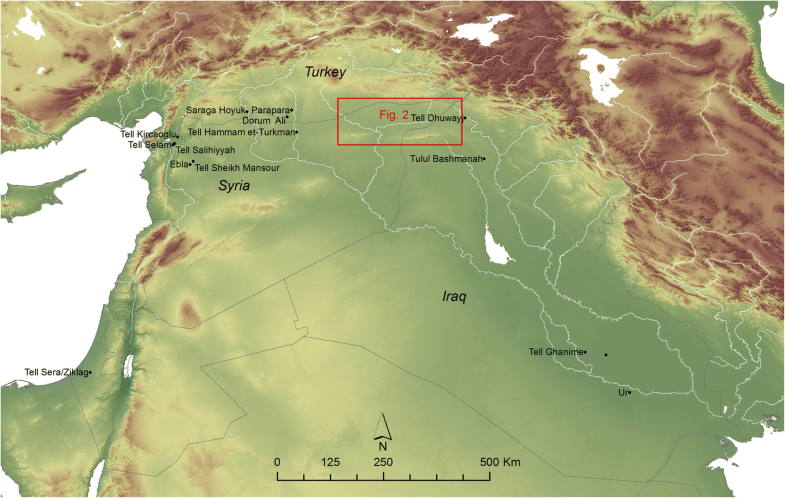 Northern Mesopotamia in the Early Jazirah (EJ) I-II period (ca. 2900–2500 BCE) was characterized by the reduction of social complexity and the landscape consisted of dispersed small settlements, with a few centers measuring 15–25 ha (Stein and Wattenmaker 2003; Ur 2010a, 401–403; McMahon 2013, 464). At the end of the EJ II (ca. 2600–2500 BCE) and in the EJ III periods (ca. 2500–2300 BCE), northern Mesopotamia experienced a rapid process of urbanization, where cities such as Tell Mozan, Tell Leilan, and Tell Hamoukar expanded from 15 ha to around 90–120 ha (Ristvet 2005, 59; Ur 2010a, 405; Ur 2010b, 105–109; McMahon 2013, 464; Lawrence and Wilkinson 2015, 333–335). Some sites, such as Tell Brak (65–70 ha), Tell Beydar (25 ha), and Tell Mohammed Diyab re-expanded (Ristvet 2005, 59; Ur and Wilkinson 2008, 307–308; Ur et al. 2011, 9–11), while new major cities, such as Tell al-Hawa, just to the east of the KT, emerged (Wilkinson and Tucker 1995, 50–53). Although historical texts are largely missing from this period, with the exception of sites such as Ebla, Mari, and Tell Beydar, scholars have generally assumed this was a period of city-state competition (Archi 1998; Akkermans and Schwartz 2003; Archi 1998). In the late third millennium (EJ IV-V, ca. 2300–2000 BCE), settlement area reduced and the number of sites decreased. The causes of this change are still unclear and some scholars link the abandonment of settlements or their reduction in size to global climate change events (Weiss et al. 1993; Weiss 2017), while others advocate an interplay of unfavorable climate conditions in tandem with the exceeding carrying capacity of the land by the large urban centers (Wilkinson 1997; Wilkinson et al. 2007). In the first half of the second millennium BCE (Old Jazirah I-II, ca. 2000–1600 BCE), there is a resurgence of urbanism and the KT consists of a three-tiered hierarchy of settlement area, with few dominating large urban centers measuring 60–90 ha (Tell Leilan, Tell Farfara, and Tell al-Hawa), several medium-sized sites of 15–35 ha (e.g., Tell Muhammed Diyab, Tell Brak, Dumdum, Tell Mozan), and many small villages and farmsteads. This settlement structure arguably reflects the actual political landscape in the early second millennium, which was mostly fragmented into several independent city-states (see Charpin and Ziegler 2003; Veenhof and Eidem 2008, 290–321; Ristvet 2008, 2012; Palmisano 2015, 2017; Palmisano and Altaweel 2015), except when it was part of the Amorite kingdoms of Shamshi Adad I (ca. 1808–1776 BCE) and Zimri-Lim (ca. 1780–1758 BCE; Villard 1995, 873; Charpin and Ziegler 2003; Eidem 2000, 2008). The late second millennium BCE witnessed the rise of the Mitanni and Middle Assyrian Empires respectively, but by the eleventh century the Assyrians had declined (Radner 2015). Throughout this period, large and small sites were often present within mounded settlements. Table 1 lists some of the key surveys and works in the KT that reflect LC and Bronze Age (ca. 4200–1200 BCE) settlements (Fig. 2). Many of the dated sites have associated hollow ways, which are informal landscape features (tracks or paths) generated by human or animal movement and radiating out from known mounded settlements (Wilkinson 1993, 1994; Altaweel 2003, 2008; Ur 2003 and 2009; Casana 2013). Hollow ways are broad and shallow (often 60–120 m wide and 0.50–2 m deep) linear depressions in the landscape (Ur 2010b, 76–78; Wilkinson et al. 2010, 766–767). Despite their size, these features are very difficult to detect on the ground: the largest ones can be visible with specific light conditions and oblique angles or after atmospheric events such as a flooding when these features infill with water. Figure 3 illustrates a relatively rare example when these features become evident from ground level. Given this, the detection of hollow ways often necessitates the use of aerial imagery. Therefore, a major contribution in detecting hollow ways has been made by aerial photography and satellite imagery, especially declassified CORONA satellite images. The CORONA program, in operation from 1959 to 1972, was launched by US intelligence with the purpose of monitoring sensitive strategic areas by spy satellites.1 High-resolution CORONA satellite images have been widely used in the Middle East to detect small, often mounded sites, including small sites (< 1 ha), ancient tracks, and irrigation channels (Philip et al. 2002; Altaweel 2008; Casana et al. 2012; Casana and Cothren 2013; Casana 2013).2 The available data have allowed the mapping of about 6000 km of tracks in the Upper Khabur valley (Ur 2010b, 76), highlighting a busy landscape characterized by interconnecting and overlapping tracks. The use of hollow ways as pathways or tracks has been widely accepted by most scholars despite some interpreting these features either as channels to harvest rainwater (McClellan et al. 2000) or as modern roads (Weiss and Courty 1994). The association of these features with ancient roadways has been based on hollow ways traversing multiple watersheds and often leading to known gates at ancient sites (Wilkinson 1993, 1994; Altaweel 2008). Recent geomorphological studies have demonstrated that these informal linear tracks were already incised during the fourth millennium BCE (Wilkinson et al. 2010). Furthermore, Casana (2013) in his recent cross-regional study in the Near East has demonstrated that hollow ways are associated with nucleated settlements and specific modes of pastoral activities and land management. 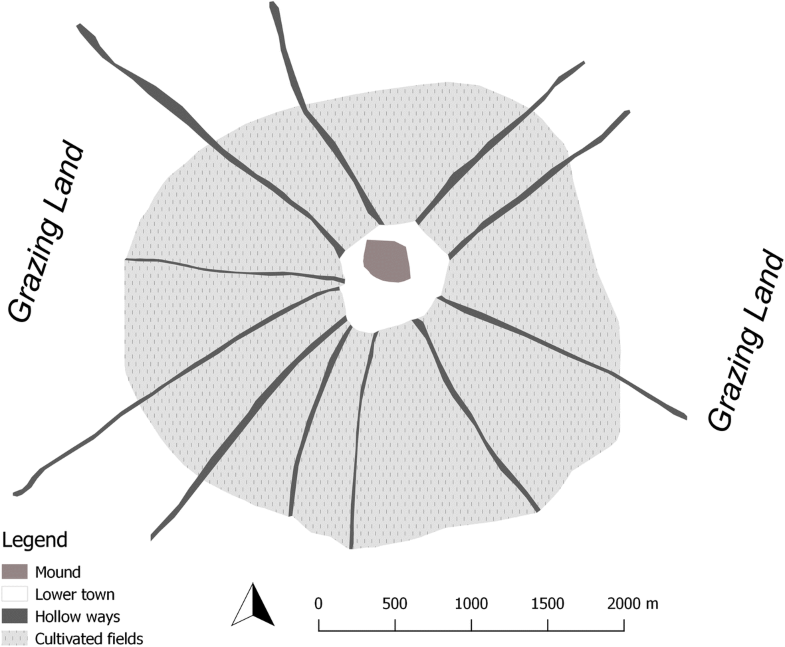 Hollow ways starting from archaeological sites show a radial pattern (Fig. 4). This is similar to some modern towns or villages in the region today with regard to their road networks. Area around sites were also possibly intensively cultivated and movement of farmers and shepherds and their flocks were constrained by the presence of agricultural fields, with boundaries regulated by patterns of land tenure and social norms (Schloen 2001; Casana 2007, 212–214; Ur 2009, 194; Casana 2013, 268). In fact, at a certain distance from settlements (generally 3–5 km), hollow ways gradually fade out, possibly because they reached the limits of the cultivation zone and the start of pastoral lands, where dispersed movement not constrained by particular fields does not create depressed tracks (Wilkinson 1994, 493; Ur 2009, 194; Fig. 4). These patterns of linear tracks radiating out from settlements are known cross-culturally in societies practicing dry-farming economies (Chisholm 1962; Wilkinson 2007). Wide hollow ways (measuring 80–130 m) radiating out from large urban centers such as Ebla, Tell Brak, Tell Leilan, and Tell Mozan resemble large droveways (tratturi) used in the Appenines of Italy and in Scotland to herd sheep and cattle between highlands and lowlands pastures (cf. Barker 1995, 34–36; Haldane 1997; Bell et al. 2002, 172;). The analysis of the radial pattern of hollow ways surrounding a settlement may be useful for estimating the area of agricultural catchments (Wilkinson 1994, 493; Deckers and Riehl 2008; Ur 2009, 195; Kalayci 2016). Most of the hollow ways in the KT are associated with Bronze Age sites, although some of them could be dated to the fourth millennium BCE, when extensive proto-urban centers arose in the alluvial plains of northern Mesopotamia (Ur 2010a, 395–396; Wilkinson et al. 2010). In this area, Byzantine and early Islamic sites dated to the second half of the first millennium AD are associated with these features that, nonetheless, are narrower in width (around 10/15 m) and never are as broad as the ones dating to the Early Bronze Age site, which can be more than 50-m wide and reach 100–130 m in exceptional cases (Van Liere and Lauffray 1954–1955; Ur 2010b, 145; Casana 2013, 259). The North Jazirah and northern Mesopotamia in general, including the KT, are ideal for the preservation of hollow way features due to the semi-arid nature of the present landscape and the fact that settlement activity and agriculture were not as intensive in later periods. Other parts of the Middle East, such as Iraqi Kurdistan (e.g., Altaweel et al. 2012), are not as well preserved or preservation is relatively more limited in other places (Casana and Cothren 2013). Nevertheless, examples of these road systems and their associated settlements have been found in the southern Levant (e.g., Tell Sera/Ziklag; see Fig. 1), the northern Levant (e.g., Ebla, Tell Sheikh Mansour), the Balikh valley (e.g., Tell Hammam et-Turkman, Parapara), the Amuq plain (e.g., Tell Kirkaoglu, Tell Selam; cf. Casana 2003), the Upper Tigris region of northern Iraq (e.g., Tulul Bashmanah, Tell Dhuwayj; cf. 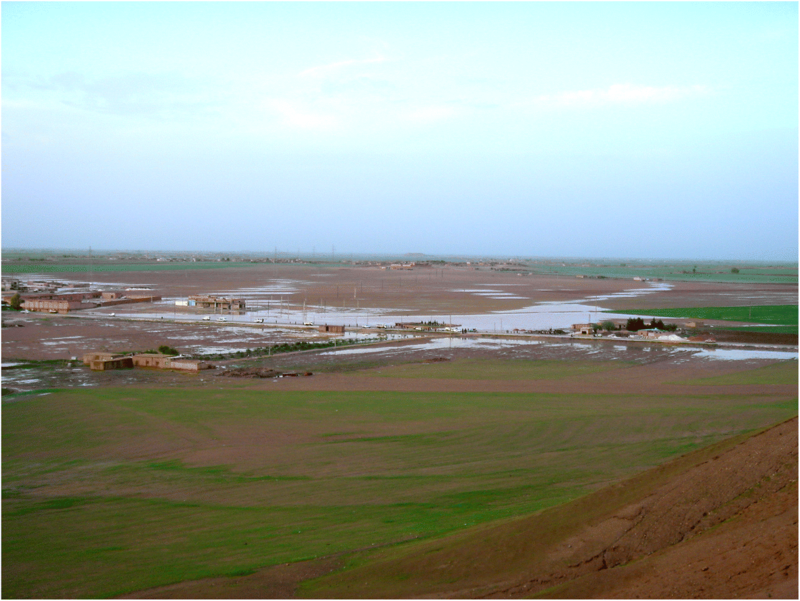 Altaweel 2003, 2005; Mühl 2012), and in southern Mesopotamia (e.g., Ur, Tell Ghanime). 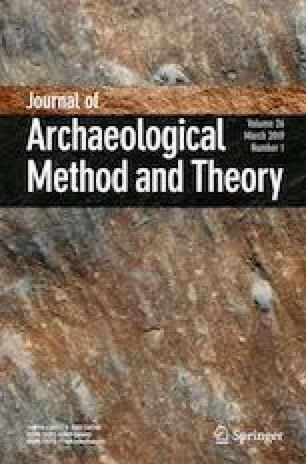 To assess archaeological sites and hollow ways used in this study, we conducted a comprehensive review, standardization, and synthesis of settlement data from reports and gazetteers of archaeological surveys carried out in the KT (see Meijer 1986; Wilkinson and Tucker 1995; Eidem and Warburton 1996; Lyonnet 2000; Ristvet 2005; Wright et al. 2006–2007; Ur and Wilkinson 2008; and Ur 2010a, b; see Table 1 and Fig. 2). This step allowed us to identify and spatially locate settlements occupied in the KT in the LC (ca. 4200–3000 BCE) and in the Bronze Age (ca. 3000–1200 BCE). Although soil micro-morphological techniques can be used to date hollow ways (e.g., Wilkinson et al. 2010), generally they are dated on the basis of the occupation periods of the mounds from which they depart. Therefore, one major caveat is represented by multi-period sites that have been occupied for hundreds of years, where we cannot guarantee an accurate chronology for hollow ways radiating out from sites. Nevertheless, preserved remains of mounds and hollow ways provide minimum values that can be used for measurements looking at relationships across time. We assess the chronological evolution of the network of hollow ways distributed over the KT and we focus our analysis exclusively on these features’ spatial association with the site mounds from which they depart. To measure sites and hollow ways, we made use of the CORONA Atlas of the Middle East (see Casana et al. 2012; Casana and Cothren 2013), which represents an excellent source of more than 1000 images georeferenced and orthorectified and freely downloadable.3 Hence, settlement data have been recorded, where possible, as georeferenced polygons, with hollow ways departing from them being digitized. Different measures were initially investigated, before we made a selection of what variables to measure, including overall area and minimum and maximum area estimates for mounded sites. For hollow ways, widths, number of hollow ways from sites, lengths, and combination measurements that included different measures (e.g., length and width) and number of hollow ways were assessed (Fig. 5). We eventually simply used the measured mounded area for sites, which seemed to be the best proxy for population where larger sites generally represent greater population at some point during the mound’s history. Although this assumption is not consistent across different regions of the world (cf. Drennan et al. 2015, 20–25), we prefer this approach and do not multiply the mounded area by a population density constant, which is likely to covariate with settlement area and that is still the subject of a long-lasting debate among scholars (cf. Adams 1981; Postgate 1994; Colantoni 2017; Steinkeller 2017; Stone 2017). In addition, one issue is that most existing publications indicate only the overall extent of mounds but neither the size for a particular chronological phase nor the extent of the surrounding lower town. In the present study, we adopted a more cautious and conservative approach and chose the mean of hollow way widths to compare to mound area, as these showed a more developed relationship based on visual assessment and goodness-of-fit measures. Testing the hypothesis that there is a statistically significant positive relationship between mean hollow way widths and site mound area shows we can reject the null, at p < 0.01 level, using a Pearson correlation coefficient, on mean hollow widths and mound area. Given the evident relationship between mound area and mean hollow way widths, we chose to focus on these two measures. One issue is that hollow way preservation, including their lengths, are likely affected by continual land use, such as modern agriculture that destroys these features. We decided to exclude the hollow ways’ length and number from the analysis due to their weaker relationship to site area, although we suspect there could have been a relationship. For area measurements, not all archaeological surveys carried out in the KT provide estimated extent of sites per cultural period and very few examples record the area of surrounding lower towns (e.g., Wilkinson and Tucker 1995; Ur and Wilkinson 2008; Ur 2010a, b; Ur et al. 2011). For all hollow ways, we took three measurements, using their widths (i.e., one at the beginning, one at the middle, and one at the end; see Fig. 5). From these three measures for each hollow way, averages were then used for all hollow ways associated with a site so that there was one average width measurement for each site. This gives one hollow way measure to then compare to site area. For each measurement used to create the average, we recorded the maximum visible width. These measurements have been standardized by taking into account how the appearance of hollow ways can vary from CORONA images taken at different times of the year due to changing soil moisture conditions (Ur 2010a, b). In practice, for a given specific area, we scrutinized and compared several CORONA images taken in different months of the year. This is because different seasonal images may affect the perception of how wide a given hollow way is (e.g., more water in a hollow way could make it appear wider). A total of 388 settlement mounds, called sites or mounds here, and 1408 hollow ways have been collected using the above approach. From these, 312 sites were associated with hollow ways; these sites and associated hollow ways were used in the analysis. The data used for scaling analysis are provided in the supplementary data file. In this case, i is each indexed mounded site and ξi represents specific log deviations among sites to produce Y estimates (Lobo et al. 2013). These deviations can be statistically measured to assess patterns of variation within overall measurements made and the type of distributions evident in adjusting to empirical measurements. A key issue is the quality of hollow way and site preservation as well as the sample number. Preservation skews sampling, as sites with more hollow ways or those with less might not reflect what the layout of hollow ways were relative to mounds in any one period. The sample number should be comprehensive to enable a confident estimate for values that are representative, while also removing samples that may bias results. Sites varied from 1 to 32 hollow ways, with Tell Brak (site 168) having the most. The average number of hollow ways for sites is 4.66. 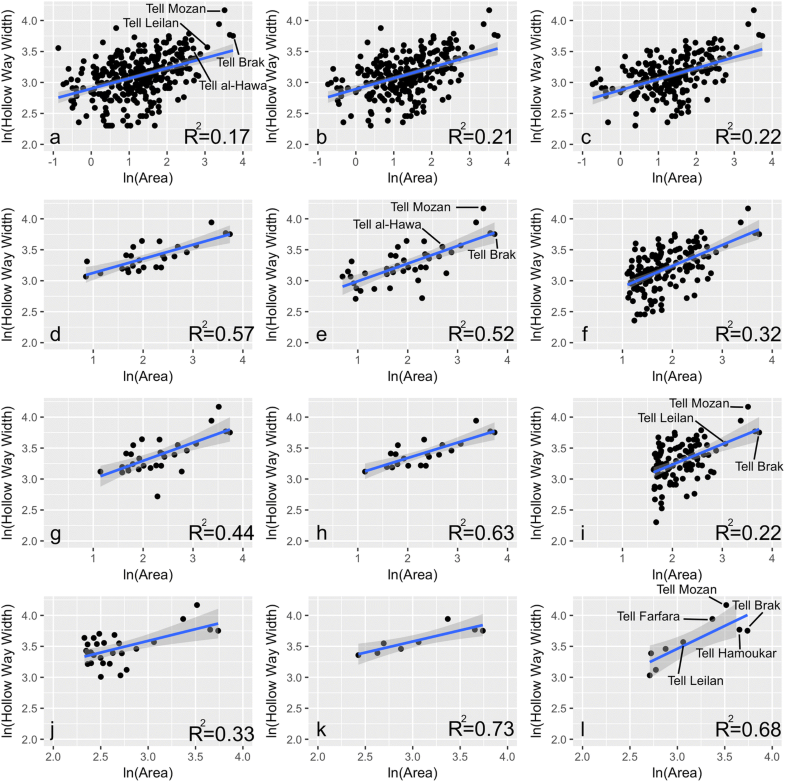 Therefore, to find the best-fit constants (Y0) and β coefficients for sites collected and to reflect variation in data affecting results, different minimum site areas in analysis, ranging from 0 to 20, and number of hollow ways, ranging from 1 to 12, were used. Least squares fitting was done to find the best-fit coefficient results that produced the least error for estimated hollow way widths relative to empirical observations. Figure 6 indicates the fit results for minimum site areas, the minimum number of hollow ways, and β tested. Table 2 gives further details on some of the better-fit results, including the minimum values for number of hollow ways and site area used in the tests. The confidence intervals (CI 95%) are also provided for Y0 and β. Two error values are given, which are the mean absolute error (MAE) and root mean square error (RMSE), between estimated and empirical hollow way widths. 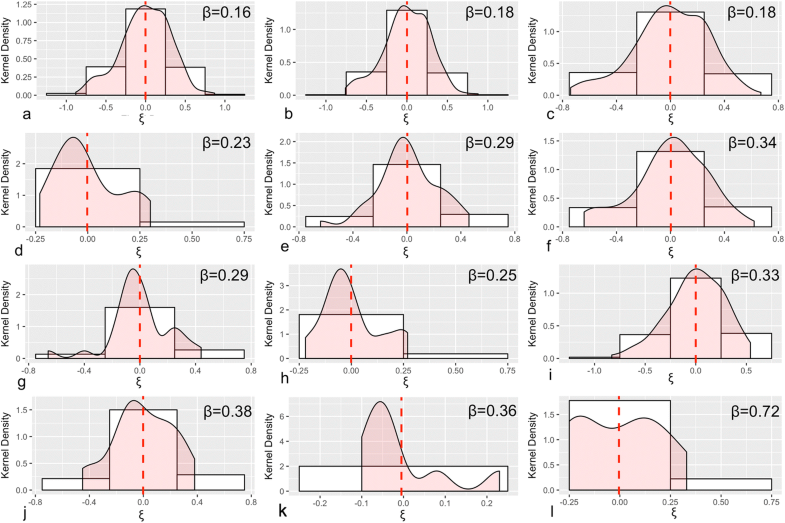 What the figure and table show are sites with more hollow ways included in analyses produced the best estimated hollow way width error results, that is the least error, with sites with 11 or more hollow ways having β = 0.23–0.36. Many of the larger mounds, averaging 11.7 ha, have 11 or more hollow ways, where relatively few sites reach such area and have many hollow ways (Table 2: k). While some combinations show relatively good fit, those often have relatively fewer samples, as many sites do not meet the criteria (i.e., having a high number of hollow ways and greater area). Applying different minimum thresholds not only allows us to see how this affects key measures, in particular β, but it demonstrates how different models could be applied in light of uneven preservation of hollow ways and mound areas or simply variation in samples for different sites areas and hollow ways. Furthermore, it allows us to see if multiple β patterns are evident in the data. The best results in Table 2 that had at least 100 sites included in the analysis is when all site areas are included, that is area > 0, and there are at least 3 hollow ways (Table 2: c), where the MAE width error measured 4.91 m. This allowed 202 sites from the total to be analyzed, yielding β = 0.18, well within sublinear scaling. The β measure allows us to see if different patterns exist for different subsets of data for given mound area and hollow way widths. Another result of this analysis is the evident variability in the relationship between measured widths of hollow ways and mound areas. The range of ξi are measured and can be used to show adjustments needed in the model in order to get the best individual fit for each site to determine hollow way widths (Yi). This also allows us to know the type of distribution for ξi that can be used to provide a range of hollow way width estimates from site area, which is useful in creating a model that can estimate possible hollow way widths in cases where these features are missing. Figure 7 indicates distributions for ξi, where the letters in the graph corresponds to the letters in Table 2. The kernel density measures allow us to see that graphs a–c and f resemble normal, that is log-normal, distributions for ξi, while graph i appears somewhat similar to a normal distribution. An applied Cullen and Frey (1999) test on these graphs’ distributions shows they are similar to normal distributions; these graphs have ranges of − 0.44 to − 0.27 skewness and 2.95–3.09 for kurtosis. This indicates that the normal distribution standard deviations could be used to capture a high probability for the range of hollow way width estimates within the models associated with those graphs. In fact, such results are similar to findings in Ortman et al. (2015), which measured mean house area and settlement population. for sites. A site such as Tell Jamous (site 10; 4.23 ha in area) would then result in the expectation that hollow way widths should be approximately between 17.46–30.14 m, for 1 standard deviation, or between 13.29–39.61 m for 2 standard deviations. In fact, that site averaged 21.66 m for hollow way widths, where it had 4 hollow ways. Similarly, this can be applied to other sites and standard deviations for ξi in Table 2: a–c, f, and i. Figure 8 shows linear regressions using the natural log of hollow way widths and site areas. This shows that graphs k and l (see letters in Table 2) have the best linear fits, at r2 = 0.73 and r2 = 0.68 respectively. While the sample number of sites is low (8 and 9 respectively), larger sites and those with many hollow ways (e.g., h, k, and l) generally appear to show better fit between hollow way widths and site area. On the other hand, smaller sites and those that have fewer hollow ways show greater disparity among the results and weaker fit. This could suggest two general, underlying patterns, where one is relevant for smaller sites and those that have generally fewer hollow ways and the other is for larger (i.e., ≥ 3) sites which often have more (≥ 11) hollow ways. For sites between 0 and 2 ha, β ranged from 0.16–0.29. In fact, if we rerun sites so that only small sites (≤ 2) are included, thus excluding large sites, and having a minimum of one or two hollow ways, then β is even lower at 0.11 and 0.2 respectively. However, a lot of disparity is evident, where r2 remains below 0.2. For cases where more hollow ways (≥ 11) and/or greater area for sites (≥ 3) are analyzed, β increases in range, where it is 0.23–0.72 in Table 2’s examples. While overall there are far fewer mounded sites and hollow ways preserved outside of the KT and northern Mesopotamia in general, obtaining site area and hollow way widths from other sites allows us to test to see if comparable patterns are evident outside of the KT. Therefore, a total of 15 sites and associated hollow ways have been collected and are included in the associated supplementary files with this article. The periods covered the LC and Bronze Age for these sites and they were from western Syria, the Levant, southern Mesopotamia, and southeastern Anatolia. The variation in regions allows us to see if hollow way width and site area relationships are spatially comparable among these regions. Table 3 summarizes some of the results using the different parameters, similar to the KT; Fig. 9 indicates regression values showing goodness-of-fit using a linear least squares regression similar to before. As there are relatively few sites analyzed, the results can only be preliminary. Nevertheless, the β results, that have the greatest number of sites analyzed in this example, do show β range between 0.18–0.23, similar to the KT sites that also included the largest number of sample sites (Table 2: a–d). This could suggest some common range in β is evident among spatially diverse regions. As with the KT, Fig. 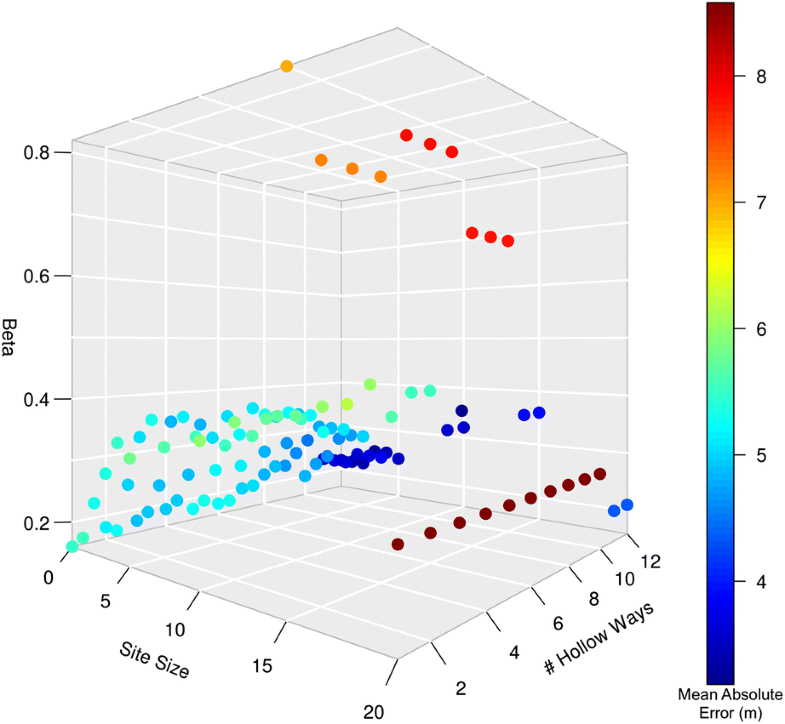 9 indicates some wide disparity between site area and hollow way widths, where fit improves by increasing site area analyzed and number of hollow ways. What this work demonstrates is that some scaling effects between site area and hollow way widths are evident. This has implications for settlement and land use/landscape archaeology, as similar studies of the past, so far, have not looked at how wider regions around settlements may scale in relation to settlements. However, our results are exploratory, in that they provide an initial assessment of how settlement area, a proxy for population, and hollow way widths, or road widths, scale. We cannot conclude that the relationship is strong in all cases, where there is considerable variability in results, but the clearest result we can conclude is site area and hollow way widths generally show a sublinear scaling relationship. This suggests that ancient transport remains in the KT that connected sites and field systems, and likely extending to other regions, reflect properties of efficiency relative to population growth that allow them to grow at β < 1.0 levels (Bettencourt et al. 2007; Levinson 2012; Bettencourt 2013). Put simply, road network widths do not increase proportionally to population because if given urban centers grow, the existing roads will drive or accommodate some of the augmented traffic. In part, the comparison is between an extensive system, that is area reflecting an aggregate measure, and an intensive system, or hollow way widths, that is a per capita measure (Ortman et al. 2016). A scaling relationship is evident between these two types of systems, but one that may likely have generally lower β values than comparing like systems (i.e., intensive to intensive or extensive to extensive). While one clear scaling pattern between site area and hollow way widths is not entirely evident in the KT, there could be multiple patterns that reflect greater variability, particularly for smaller sites and those with fewer hollow ways. For the most general scenarios that included the largest number of sites, β ranged below 0.2, while sites with area between 0 and 2 showed β ranging from 0.16–0.29. In fact, β ranged between 0.11–0.2 when only sites between 0 and 2 ha were analyzed. On the other hand, when only focusing on larger sites or those that had more hollow ways, such as 3.0 ha or more or having 11 or more hollow ways, we see β ranging between 0.23–0.72. In particular, for smaller sites and those with fewer hollow ways, there is a lot of variability, as is evident in Fig. 8, where differences in area and hollow way measures more greatly affect logarithmic measures such as those seen. In part, measurement errors or preservation are more sensitive for smaller sites. The β = 0.72 achieved for Table 2: l is more similar to the ≈ 0.8 achieved by Bettencourt et al. (2007) for urban infrastructure such as roads (see also Bettencourt 2013, 1439), although previously this assessment was on road lengths and population. Having lower β, closer to 0.3, such as Table 2: k and others, could be expected in comparing intensive and extensive systems such as those compared here. 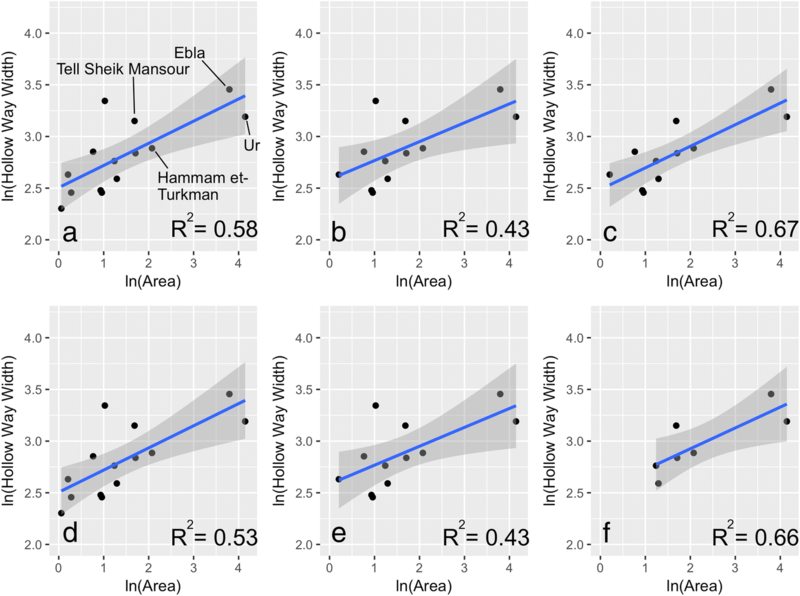 Other scaling analyses also show greater disparities among measured values at the lower ends that is smaller population areas (e.g., Bettencourt et al. 2010; Lobo et al. 2013; Ortman et al. 2015). This could suggest that such deviations observed here among smaller sites are to be expected. Once larger sites are investigated, deviations become more minor, which results in better fit results. Overall, we can state that larger sites’ infrastructure that is hollow ways, were more intensively used than smaller sites. Sites from regions outside the KT likely demonstrate similar results to the KT, at least for the lower β values that are similar to Table 2: a–d. Similarly, greater variation is likely evident for smaller sites which explains also the lower β value. As Casana (2013, 27) has recently pointed out in his recent cross-regional study, hollow ways reflect agro-pastoral economies involving the movement of massive flocks of sheep/goats, management of cultivated and grazing lands of local households, and seasonal migrations to grazing lands outside agricultural catchments of settlements. The area studied (Fig. 1) encompasses sites adjacent and within the so-called zone of uncertainty, which is the drier agro-pastoral zone with mean annual rainfall between 200 and 300 mm today. This area has been seen as riskier for cereal cultivation and more suitable for sheep/goat husbandry, where hollow ways reflect movement of sheep/goats to pastures (cf. Wilkinson et al. 2014, 53–55, Fig. 3a). The percentage of sheep/goats in the zooarchaeological assemblages of LC and Bronze Age ranged between 40 and 70% in sites located in the Tigris-Euphrates and in the KT, and between 60 and 90% in the Syrian Upper Euphrates and in the Balikh valley (for a summary cf. Wossink 2009, 104–106, Fig. 6.2). In the Middle Khabur valley, the percentage of caprines raises from 30 to 90% in the latter half of the third millennium and in the early second millennium BCE (Zeder 1998). The increase of caprines in the Fertile Crescent reveal a specialized economy of sheep/goats already evident in the LC (Algaze 2008, 77–92) and that reached a full development by the middle third millennium BCE, perhaps because of commodification of textiles and wool production in Near Eastern polities (McCorriston 1997; Stein 2004; Wossink 2009, 107–110; Porter 2012). In this context, we can postulate a relationship between hollow ways and the magnitude of the pastoral economy of the corresponding settlements, where increased settled area, or population, does not match an equivalent growth in economic activity. This corroborates the view of Wilkinson about the sublinear relationship between population and productivity levels of agricultural lands (1994, 495–496). In addition, the higher β values for larger sites with more hollow ways radiating out from them may mean that those sites experienced similar urban scaling regularities of contemporary cities. In this perspective, the elaborate network of LC-Bronze Age roads should be seen as the result of interactions between settlements, where individual farmers, labor supply, and flocks of caprines moved across the landscape and were drawn to cities from the surrounding villages or from exogenous sources (cf. Lawrence and Wilkinson 2015, 339–40; Palmisano and Altaweel 2015, 227–228). However, larger settlements appear to have attracted more substantial feedback that is intensive growth, and demand for pastoral animals than their smaller counterparts. In particular, the widths of hollow ways could be a proxy of the magnitude of goods and people flowing from and into urban centers. Bronze Age textual evidence from Ebla and Tell Beydar reveal, at least in part, an institutionalized and centralized pastoral economy where massive flocks of caprines (estimates for Ebla range from 670,000 to 2 million; cf. Pettinato 1991, 82; Milano 1995) were directly managed by the palace (see Sallaberger 1996, 2004). This could explain the positive correlation between the widths of hollow ways and the area of larger settled mounds (see Fig. 9), where economies of scale of primary and secondary agro-pastoral products could be managed mostly by large urban centers. The width of hollow ways could demonstrate the flow of food surpluses that large urban centers, exceeding the carrying capacity of their agricultural catchments, had to import from surrounding villages of the hinterland (Wilkinson et al. 2007; Ur 2009, 194–195). Furthermore, the hollow ways in the KT can be seen as highways that favored long-distance contacts and distribution of prestigious and exotic goods (e.g., obsidian, ivory, lapis lazuli) in the LC and Bronze Age towards prominent urban centers such as Tell Brak, Tell Hamoukar, and Tell Mozan (cf. Khalidi et al. 2009; Stein 2012; Massa and Palmisano 2018). Perhaps then, unsurprisingly, small sites with an area equal or lower than 2 ha have a low β value (0.1–0.2), where this reflects the minor role of small sites in drawing population from other settlements and in attracting goods and products from exogenous sources. In the KT, the great variability of values for smaller sites (r2 = ~ .2; see Fig. 8:a–c, i) could be due to the fact that some of those small sites surround large urban centers, such as Tell Brak and Tell Halawa, which are associated with wider hollow ways. As formerly proposed by several scholars (Wilkinson 1993, 1994; Deckers and Riehl 2008; Ur 2009; Casana 2013), hollow ways’ widths can be seen as flow of staple goods that surplus producers, such as small rural settlements, provided to the large urban centers that may have exceeded their carrying capacities. Some sites could have exploited the steppe landscape by focusing on animal production or mixed grain agriculture with pastoralism, which could affect the shape and evident area of sites (Castel and Peltenburg 2007). It is possible that corrals or other animal pens made up some of the space for certain sites, affecting area. Specialized pastoral sites may demonstrate wider hollow ways, whereas less specialized sites could be narrower, all of which could reflect the evident disparity we see in results. Finally, preservation and taphonomic factors in the archaeological record could, of course, affect evident variation, perhaps with smaller sites particularly affected. Despite the variations evident in results, overall errors (MAE; RMSE) from some models (Table 2: a–c, f, i) indicate that one can estimate average widths of hollow ways, albeit with some caveats given the variations we see. Even though r2 fit measures were low in some tests, the fact that distributions in places did conform to normal distributions makes the range of possible hollow way widths something that can be estimated where it is missing. This has relevant implications, above all if we accept that the hollow ways were the results of agro-pastoral activities and the main axes on which the flow of people, animal herds, and people transited as a result of the interaction between large urban centers and their surrounding rural hinterland (villages and hamlets; cf. Ur 2009; Wilkinson et al. 2010; Casana 2013; Palmisano and Altaweel 2015, 227–228). Given the fact that variations appear to show a normal distribution, such as that using β = 0.18 with Y0 = 17.7 (Table 2: c), this allows us to estimate possible widths for average hollow ways for sites, within 1–2 standard deviations for instance, including sites missing these features. In fact, Table 2: c’s model could be the best in terms of error measures given, while also focusing on sites where these features are relatively well preserved (i.e., with 3 or more hollow ways). In this case, β has a standard deviation of 0.273. Nevertheless, it is also evident there might be other possible patterns, where β is likely to be greater but sublinear, particularly for larger sites and/or those with more hollow ways. Although our work is exploratory and clearly the relationship between settlement area and hollow way widths is not always easily evident, the benefit of this work is it demonstrates scaling models can be used to evaluate relationships between sites and hollow way widths. This has important implications for understanding how land use and landscapes around settlements relate to settlements in the past. The models given can be used to give a range of estimates for hollow way widths for sites where these features are missing. The results also imply transport efficiency between sites, as sites scaled to larger areas in the LC to Bronze Age. The results achieved by this work could certainly improve by acquiring more exact dating for sites and measures for area extent. The use of site mounds for area is not ideal, as this neither represents true site area in a given period nor the full extent of sites if all periods are considered. An improvement of this research could involve probabilistic models to address the temporal uncertainty in the archaeological dataset (see Crema et al. 2010; Crema 2012). Improvements in dating and measurement of full site extent or even hollow ways width could benefit results achieved such that the accuracy for the range of β for estimating hollow way widths, and even site area if hollow way widths are initially known, is possible. One thing we did not do is differentiate between hollow ways that connect to sites and hollow ways that only extend to fields in the analysis, as little difference was noticed between the two types. However, for some regions, there could be different patterns in scaling between interurban and field-connecting hollow ways that we did not easily differentiate. As a way to expand this study, scaling relationships that estimate the number of animals herded out from a site could also be potentially developed using the results presented hear by looking at density of animal concentrations in herds (e.g., through ethnographic data as a baseline measure). This could look at density of animals that form across tracks and such numbers could then be scaled to settlement areas. In effect, we would expect some power law relationship between herd sizes and hollow way widths that also relates to settlement area. Such analyses could further investigate the extent that hollow ways reflect agro-pastoral economies in settlements. Other studies could investigate intra-urban roads compared with site area in a similar fashion as this paper, in particular for single period sites where road features are more likely to be evident and correlated with urban area. This could provide another potential for extrapolating scaling values that allow one to estimate road feature qualities where they are not evident, while also providing potential theoretical insight. The declassification of US Corona satellite images by the US government in 1995 and consequently their open dissemination to any user at low prices (about 30$ per scene), the relatively high resolution of these images (2 m), and the almost total coverage of western Asia make these data an essential tool for landscape archaeology in the Near East. On the website of the the University of Arkansas’ Center for Advanced Spatial Technologies (CAST), it is possible to have access to a database of georeferenced CORONA satellite images covering most of the Middle East: http://corona.cast.uark.edu/ . On the website of the University of Arkansas’ Center for Advanced Spatial Technologies (CAST), it is possible to have access to a database of georeferenced CORONA satellite images covering most of the Middle East: http://corona.cast.uark.edu/ . Casana, J., Cothren, J., & Kalayci, T. (2012). Swords into ploughshares: archaeological applications of CORONA satellite imagery in the Near East. Internet Archaeology, 32(2), https://doi.org/10.11141/ia.32.2. Wilkinson, T.J. (2007). Ancient Near Eastern route systems: From the ground up. ArchAtlas, February 2010, edition 4: http://www.archatlas.org/workshop/TWilkinson07.php. Accessed 03/26/2018.